Okay, in true Top 10 fashion, let’s start the countdown at number 10. The guest bath in our new South Carolina home made number 10 on the list, though I had done very little decorating in there yet. After living in our camper for a year, we were just happy to have real toilets and showers! I have since added towel hooks, some artwork, and even a toilet paper holder- movin’ on up, y’all! Our master bedroom made the next spot on the list. I’m still hoping to convince Richard to either let me get another headboard or cut down the legs on the mile-high poster bed. I’m short, people, and it’s getting harder and harder to pull myself up onto that bed. This furniture makeover was from a couple of years ago and has been one of my own favorite projects as well. I had a hard time selling the Eiffel Tower coffee table, but it helped that a friend bought it. I have used drop cloths as inexpensive material for covering chairs, as well as numerous sewing and craft projects. The curtains in number 9 above were made from drop cloths. Before buying, be sure to check out my cautions and tips for using drop cloths. When I had my first booth in Georgia, I decorated the windows with vintage spools and burlap. Check out this post for a very inexpensive way to get burlap for your projects. I was surprised that this one made the list. Not a pretty post, but very practical if you want to keep your sofa from messing up your walls. I used this idea in our last house for storing my hair styling products. It worked rather well, though I think flat-sided containers would work better. The cups tend to rock when you open the door, and eventually work themselves loose. I loved creating the faux brick for the fireplace in our booth. My booth mate Patti came up with this idea, and I just followed orders. This is the paint portion of the project. Our technique for creating the faux bricks from drywall mud came in at number 2. You’ll need to lose any fear of getting your hands dirty to tackle this project. This continues to be my most popular and most pinned project. I show how we added feet and trim to our bathroom vanity, plus a trick for creating that free-standing furniture illusion. Have a safe and glorious New Year! you have been busy – these are great projects! praying for 2016 friend! So fun looking back, can’t wait to see what you do in 2016, I know it will be great! Great projects! Wishing you all the best in 2016! All wonderful projects but that faux brick wall……WOW!!! Awesome! I love love that bathroom cabinet update! Looks like you had a great year! I like the post on creating the brick wall. I have my heart set on something similar for the house will see building next summer so I pinned that one! Wishing you a happy 2016! Great posts all Sheila! I too was a big fan of #1! I wish #9 happens for you asap! The faux brick wall that you created for your booth looks so real! I love that idea! I look forward to seeing what you share in 2016! Thanks, Paula. Happy New Year! What a great mix of practical and pretty! I can see why they were your most popular. Happy New Year! Sheila, these are wonderful ideas! 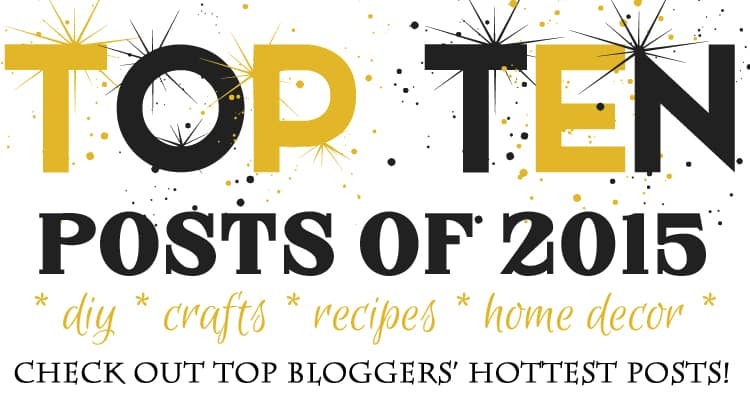 It was great to see a recap of your top projects and posts for 2015. I know this has been a busy year! Happy New Year! We love your look back at 2015! We look forward to what you have in store for 2016! Cheers to a happy New Year!